It started in January 2012, when my sister forwarded me a Groupon: $165 for a two-night stay in an ocean view room in Mendocino, plus a bottle of wine. “This is a great deal,” my sister said. “We should do it.” She did not have to do a lot to talk my husband into it. We bought the Groupon and set about trying to find a date that would work for the four of us. The problem is that the coastal town of Mendocino is a four-hour drive from my sister’s home in the Sacramento area — which is a six-hour drive from our house. This would make it tough to do over a weekend. We needed to identify a school holiday and then arrange for my husband to take a couple of days off work to accommodate the travel time. We decided on the first weekend of Spring Break. But a funny thing happened on our way up to Sacramento in March of 2012: my niece got home from school feeling sick, and her parents did not feel comfortable leaving her home alone (albeit with her cousin and older siblings). My sister suggested that Gareth and I go alone — but we did not want to do that, either. …and once again, we found ourselves unable to make it. By this time, we had lost the “deal” part of our Groupon: We each had our $165 on account, which we could redeem whenever we actually showed up to stay. 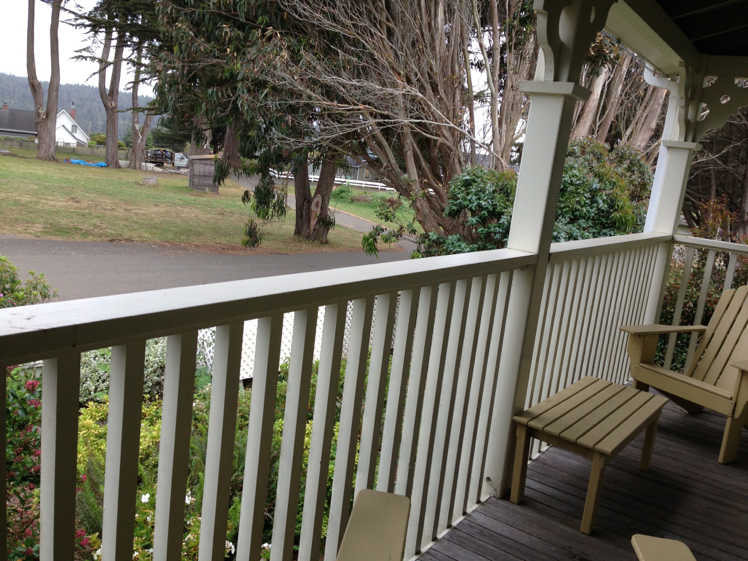 We reduced our time from two nights to one at $200 per night. So by the time we actually got in the car and made the drive to Mendocino, we were determined to make sure our money did not go to waste. We were also pretty sure that the staff had started a pool to bet on whether or not we’d actually show up this time. I was relieved not to be greeted with sarcasm upon check-in. In fact, everyone we met at the Hill House Inn was friendly and pleasant. Our rooms were spacious and clean. The furnishings were a little bit dated (which you can get away with in a historic hotel) and the televisions were older models — but we had free wi-fi, which I really appreciated since my phone didn’t work so well up there. Yes, it is a long drive to Mendocino, even from Placer County. Of course, we made the drive longer by stopping a few times in Napa Valley. We passed through Elk on the way home — lovely little community and gorgeous views. And yes — I think summer was the perfect time to visit. Maybe we’ll try it again next year!